We each give off millions of bacteria from our human microbiome to the air around us every day, and that cloud of bacteria can be traced back to an individual. New research focused on the personal microbial cloud -- the airborne microbes we emit into the air -- examined the microbial connection we have with the air around us. 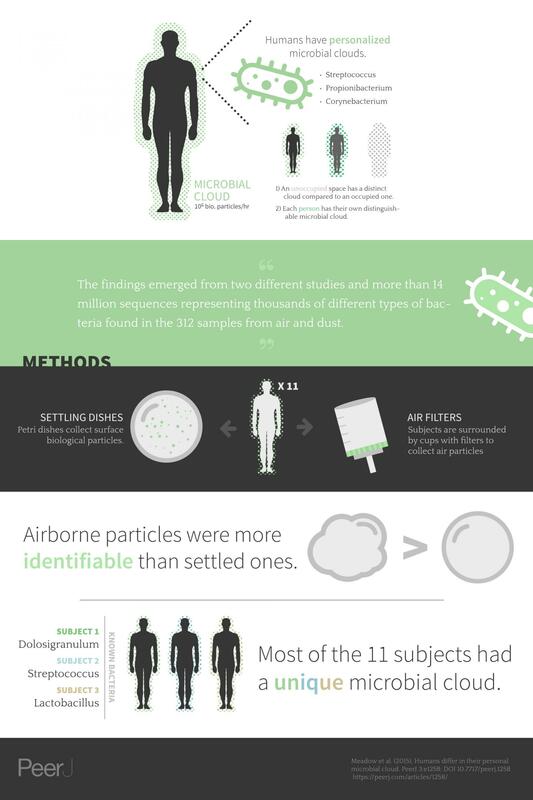 To test the individualized nature of the personal microbial cloud, University of Oregon researchers sequenced microbes from the air surrounding 11 different people in a sanitized experimental chamber. The study found that most of the occupants sitting alone in the chamber could be identified within 4 hours just by the unique combinations of bacteria in the surrounding air. That cloud of bacteria can be traced back to an individual. Credit: Image created by Viputheshwar Sitaraman, of Draw Science. "We expected that we would be able to detect the human microbiome in the air around a person, but we were surprised to find that we could identify most of the occupants just by sampling their microbial cloud," said lead author James F. Meadow, a postdoctoral researcher formerly from the Biology and the Built Environment Center at the University of Oregon. "Our results confirm that an occupied space is microbially distinct from an unoccupied one, and and demonstrate for the first time that individuals release their own personalized microbial cloud," the authors concluded. The research sheds light on the extent to which we release our human microbiome to our surrounding environment, and might help understand the mechanisms involved in the spread of infectious diseases in buildings. The results also suggest potential forensic applications, for example to identify or determine where a person has been, though it is unclear whether individual occupants can be detected in a crowd of other people.